The robot revolution has arrived. The good news is they are working peacefully and efficiently with their human masters. The better news is that when plastics processors include robotic technologies into their operations, they achieve significant productivity gains; totaling up to 30%. The savings generated from robotic manufacturing, handling, and inspection systems allow suppliers to share cost reductions with their customers and to invest in additional improvements. Precision & Productivity: End-of-Arm Tooling delivers accuracy through computer controlled processing. Accurate part placement during material handling, controlled cycle times, and exacting packaging ensures the delivery of reliable, consistent part quality. Automated step for part trimming assures the accuracy of the gate/runner removal, making sure the way parts look exactly matches customer expectations. Robotically controlled pad printing allows the images to be accurately applied to parts with branding, volumetric graduations, and instructions perfectly placed. The six-axis movement allows multiple faces of the part to be printed in one cycle. Protection & Safety: End-of-Arm Tooling technology makes injection molding a precise engineering process. The accuracy of robotic manipulation ensures that tools are protected and well cared for, significantly prolonging their useful life. 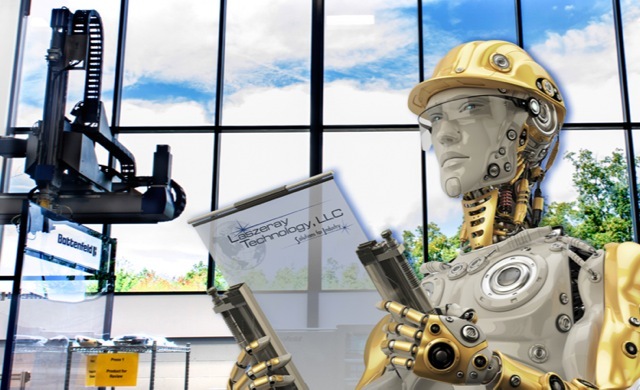 Robotically controlled systems protect machine operators from fatigue and repetitive stress injuries, leading to a safer, happier and more productive workforce. With an eye toward the future, Laszeray has invested in 17 new injection-molding machines, every one equipped with robotic End-of-Arm technology. The use of these advanced manufacturing technologies allows Laszeray to distinguish itself from common contract injection molders with increased productivity, speed and flexibility that others simply can’t match. Laszeray’s investment in robotics is only the beginning of a continuous commitment to technological advances. Our company will continue to invest in the forefront of technology advances. Currently, we are evaluating vision systems with moveable arms to offer objectivity and reliability in Quality Assurance. Many of these systems make use of artificial intelligence technologies, allowing robots to apply human-like, intuitive movements while completing the inspection process. These technologies will work in concert with other automated processes such as ultrasonic welding and post molding component insertion. The technical advantages of robotic manufacturing lead to a consistently higher quality product, faster development and delivery time and reduced production costs. The use of robotics in injection molding leads to cost savings in every area in which they are implemented. The clear reality is that humans and robots can live and work in harmony. Together, they can also thrive in success.